A thumb sprain occurs when the thumb is bent out of its normal range of movement, usually backward. It can happen in sports like skiing, rugby, and basketball and causes pain and swelling. The ligaments supporting the joint at the bottom of the thumb get damaged, and this can be helped by taping, icing, and compression. Thumb sprain symptoms include pain at the time of injury, usually as the thumb is bent backward. There may be a pain at the base of the thumb and in the web of the thumb when it is moved. Swelling over the metacarpophalangeal joint (MCP joint) at the base of the thumb may be visible and the patient may have laxity and instability in this joint. The wrist is made up of small carpal bones, held tightly together by many small ligaments. 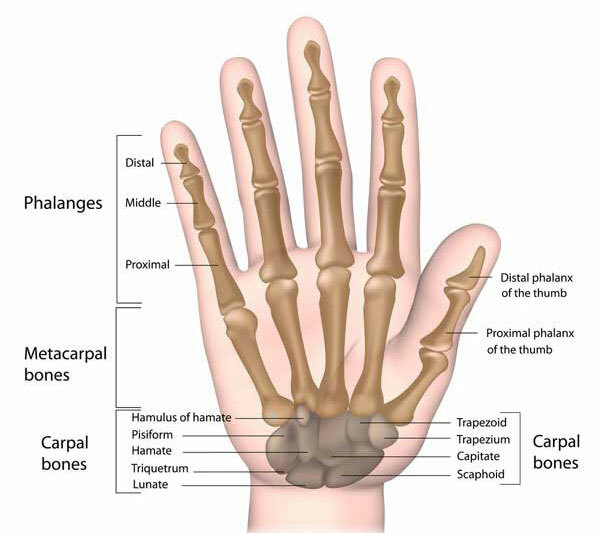 The carpal bones connect to the metacarpal bones which form the hand. The metacarpal bones connect to the phalanges bones with make up the fingers. The thumb consists of the phalanges bones which connect to the metacarpal bone at the base of the thumb. This joint is known as the metacarpophalangeal joint. It is far more likely that the thumb will be injured at the MCP joint than interphalangeal joint between the two finger bones. The thumb joint (MCP joint) has a great deal of movement and so, therefore, is likely to be a lot weaker and more likely to dislocation and sprains than the simple hinge joint higher up the thumb. The most common mechanism for injury is for the thumb to be bent backwards, stretching or tearing the ligaments at the base of the thumb on the MCP joint. This is particularly common in Skiing, Rugby, Judo and other contact sports, and ball sports such as basketball and netball. The player may catch the thumb bending it back the wrong way. They may do it more than once making it worse each time. Once the MCP ligaments are sprained then the thumb is even less stable and more likely to be injured again, especially if correct treatment is not applied. Apply the principles of PRICE or protection, rest, ice, compression, and elevation. Rest the injured hand and protect it from further injury by taping the thumb or using a wrist and thumb support. Apply ice or cold therapy as soon as possible after the injury. Ice should not be applied directly to the skin but in a wet tea towel or use a commercially available cold wrap. Cold therapy can be applied for 10 minutes every hour for the first 24 to 48 hours reducing the frequency as symptoms and swelling die down. Wearing a compression bandage or support will also help reduce swelling. This should be worn all the time during the acute phase. Later in the rehabilitation stage, a more specific taping or thumb splint support to prevent the thumb bending backward may be more beneficial. A professional therapist will assess the injury to rule out a total rupture of the ligament or a fracture. They will also advise on a full rehabilitation program consisting of mobility exercises followed by strengthening exercises. Putty exercises or hand exercise balls are particularly suitable. A surgeon will operate if required. If there is a lot of laxity and instability in the joint a total rupture may be suspected in which case the injury requires surgery. Most athletes are able to return to sport within 4 to 6 weeks depending on the severity of the injury, sometimes sooner. It is important that strengthening exercises are done to restore stability and prevent re-injury. If the injury is not treated properly then there is a greater risk of re-injury and permanent instability which will eventually require surgery. Premiership Football Physiotherapist Neal Reynolds demonstrates a simple thumb sprain taping technique to support the thumb joint. These guidelines are for information purposes only. We recommend seeking professional advice before attempting any self-treatment. The thumb can be taped in a number of different ways depending on how the joint was damaged. The basic principles of taping remain the same though with anchors being applied and support strips to prevent movement.